The Lockheed C-130 Hercules is a four–engined military transport aircraft designed and built originally by Lockheed Martin. 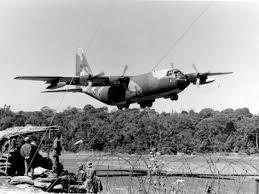 Capable of using unprepared runways for takeoffs and landings.,It was originally designed as a troop and cargo transport aircraft and noow use in a variety of other roles, such as gunship, airborne assault, search and rescue, scientific research support, weather reconnaissance, aerial refueling, etc. The C-130 entered service with the U.S. in the 1950s, which is the longest continuously produced military aircraft at over 60 years, operate in more than 60 nations. In 1946, the Chief of Naval Operations, Admiral Chester Nimitz, had a vision to create a flight exhibition team in order to raise the public’s interest in naval aviation and boost Navy morale. Since 1940's, they were flying F6 Hellcat, F8 Bearca, F9 Panther, F-11 Tiger, F-4 Phantom and A-4 Skyhawk. In 1986, the 40th Anniversary of Bule Angels, they started to fly F/A-18 Hornet and still fly to this day. Soon after the operation of Blue Angels, it became necessary for a support aircraft to move people and equipment to their show sites. 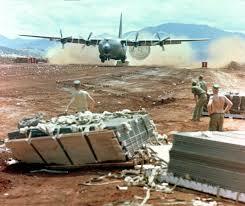 They used R4D, R5C/D and C-121. In 1970 they received the Lockheed Martin C-130 "Fat Albert.". click here for Bule Angels official website. 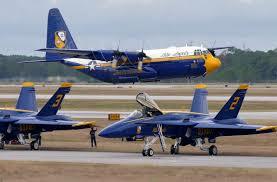 Maxford USA C130 is about 1/16 scale of Blue Angels Fat Albert. It is all made of wood, fiberglass and plastic parts. ARF comes with pre-installed retractable landing gear.